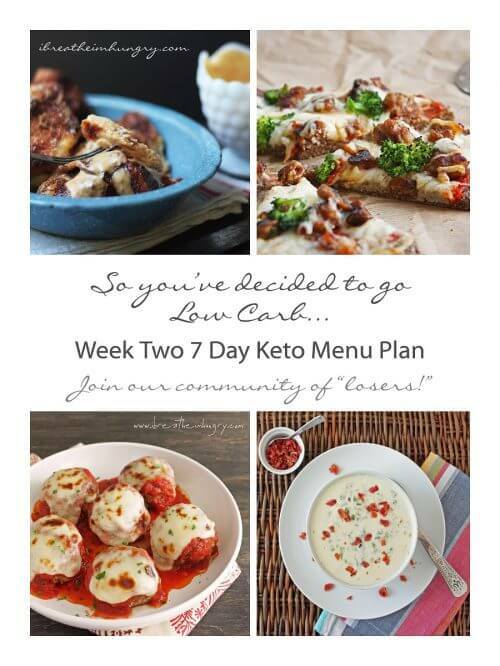 OK, can I just be honest and say that this 7 day keto menu plan thingy is a lot harder than I thought it would be???? (If you have no idea what I’m talking about, you can get caught up by reading the 3 day keto kickstart post.) I’m sure it’s just my inexperience, and it will get easier after the learning curve, but keeping the carbs below 20g, making it budget friendly, not too much time spent cooking, finding ways to repurpose leftovers, etc. takes time! This first version will be in list format, because I just didn’t have time yet to figure out other options. In the future it will either be in table format with links, in a downloadable pdf, something more user friendly than this. But this is what I’ve got this week, since I only had 2 days to figure it out so far! UPDATE: Download a printable copy of this week’s meal plan here! I kept the calories around 1600 per day give or take, and the carbs below 20g (obviously). I also posted daily nutrition totals, and also nutrition info for each item. That way, if you need to make substitutions you can figure out how it will affect your daily stats, and still keep it under 20g net carbs. You may find that you don’t need nearly as much food as this plan calls for – adjust portions and snacks to meet your own needs. Speaking of substitutions it’s time for some tough love. Hate avocados? Substitute almonds. Allergic to nuts? Eat string cheese. Whether you use these menu plans as a general guideline or follow them to the letter (or not at all), that’s completely up to you. PLEASE do not email me asking me how many carbs it would add to your day if you substitute one snack or meal from another day on the plan. That’s why I took the time to put the nutrition info on each item, so you can figure that out on your own. You may have to do some math for your own substitutions – don’t ask me to do it for you or I will get cranky. There are literally thousands of you, each with your own personal dietary, time, and budget requirements, so it’s just not possible for me to make the perfect menu for your ideal circumstances each week. I’m doing my best to make the menu plans easy to follow, not break the bank time or money-wise, and hopefully be delicious and satisfying – so please try to be flexible and reasonable with your expectations each week. For example, if you hate cauliflower, please don’t email me to ask me if I have any other suggestions for you on that particular day. Ain’t nobody (specifically me) got time for that. I don’t mean to sound harsh, but I just can’t hold your hand through every single decision you’ll need to make on what to eat each day. I have a hard enough time managing my own! Also in the comments, please keep us posted each week as to how you are doing – feeling great? Miserable? Lost a ton of weight? None? WE WANT TO HEAR ABOUT IT! I’m hoping that we can congratulate or console each other on our amazing progress (or lack thereof) each week. In fact I’m really looking forward to that part!!! Finally, as a reminder, if you haven’t gotten your ketostix yet, you should order some or run out to your Walmart or Pharmacy – they aren’t expensive and it’s nice to have validation that you are in ketosis once you get started! Ok, next I’m posting the menu plan, below that you will find a shopping list, and finally notes on suggested prep. This meal plan and shopping list is for is for one person. Note: You may find that you need to make a lot of purchases this week for the pantry and shopping list. Please be assured though that future weeks menu plans will be created with those in mind and will make use of them. Remove all the meat from your rotisserie chicken and place in a container for later. Boil the chicken carcass with peppercorns and about a gallon of water and simmer for 4 hours (or longer) to make your bone broth. You may have to add a little more water as it reduces. 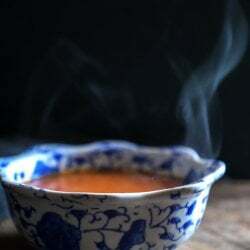 You should end up with 5 – 6 cups of concentrated broth after you strain out the solids. Add salt and lite salt (for potassium) at the end to your preference. Store in the fridge for the week or freeze. 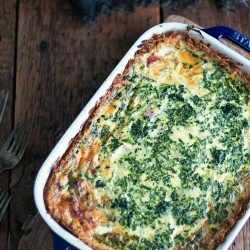 Assemble and bake your Sausage, Spinach & Feta Frittata and cut into four inch squares for the week. Extra portions can be frozen. Make ahead your Easy Cauliflower Gratin and refrigerate. Extra portions can be frozen. 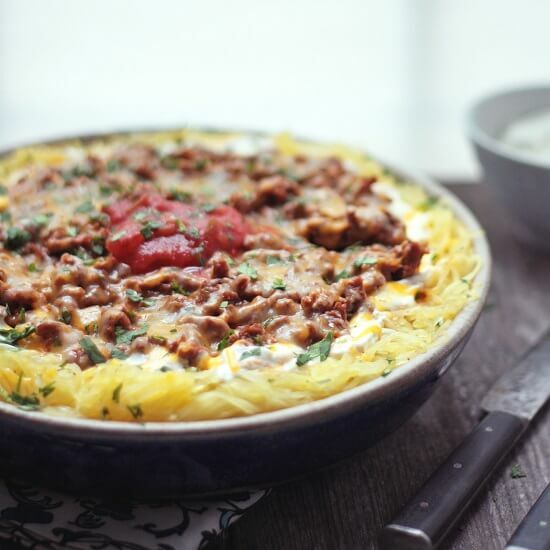 Assemble and bake your Chili Spaghetti Squash Casserole and refrigerate. Extra portions can be frozen. Make 2 batches of the Cream Cheese Pancakes and refrigerate. Heat for 30 seconds in the microwave if desired. Cook the entire pound of bacon and store in the fridge until needed. Microwave about 20 seconds before eating. Assemble Anti Pasta Salad and divide into 1/2 cup portions. Meant to be eaten cold or at room temp. 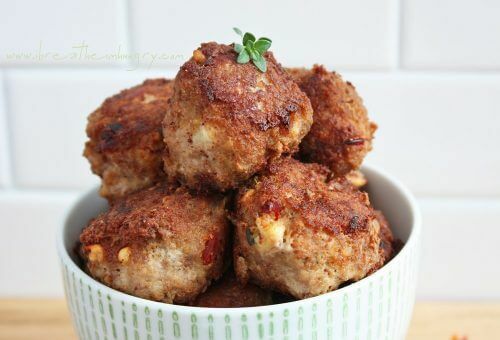 Assemble and cook the Sundried Tomato and Feta Meatballs. (DON’T EAT THEM ALL) Extra portions may be frozen. Cook the Cuban Pot Roast and set aside portions for the week. Freeze the extra portions. So there you have it. Week One down. I know it’s clunky but I’ll work on making it more user friendly next week. Looking forward to how you’re doing so far! I know some of you haven’t started yet, so I’ll look forward to hearing about your progress next week! I started on Thursday and so far I’m down 2 lbs and solidly in ketosis, and it only took a day and a half! This is why I love ketostix and being able to easily verify ketosis whenever I want to – it’s a great motivator when you’re just starting out. Still having headaches but much less than I anticipated which is a nice bonus! I’ve been drinking TONS of water and I think that’s helping with the detox so far. Hopefully I’ll have some significant progress to report by Saturday! Have a great week!!! Ready for Week Two?!?!? LET’S DO THIS! To get more great keto recipes for every season, download my super bundle of FIVE e-books for just $19.99! THANK YOU for the shopping and prep lists! Made cuban pot roast and invited family over last night. they were SO impressed, as was I. Delicious. I am a huge fan of all your recipes and appreciate you so much! I love that you took the time to do this, thank you so very much! I do have 1 question, why am I so hungry on this plan?? Like Im starving all the time. Im 6ft, 235 I work out moderately would like to work out more but Im scared because I am so hungry all the time. I am following your plan by the book, but I dont think its enough food/fat. Please help. The first week may take a little time to adjust. If it were me, initially I would up the calories, maybe eat a double portion at lunch and dinner. Also make sure that you are drinking plenty of water, some say .5 oz for every pound you way. I drink a gallon every day regardless of weight. Once your body adapts to low carb and your brain figures out how to use the fat for energy the hunger should subside. I would give it a solid 2-4 weeks just adjusting to low-carb and not worrying about the calories! I am on the first week of my new Keto lifestyle. It was kind of overwhelming in the beginning when I first tried to find information about doing Keto. I recently purchased your cookbook and am using your meal plan as best as I can as I go along this first week. 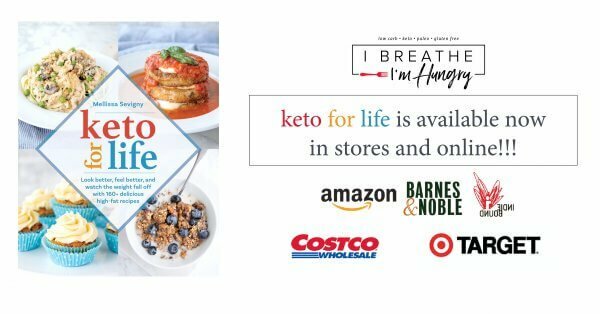 I wanted to thank you for making a cookbook that not only has delicious food, but also has a helpful meal plan with a shopping list included. I was just going to continue on and try to come up with my own meal plans after week four, but I am so excited to see the meal plans on this page. Thank you for wanting to help people succeed. 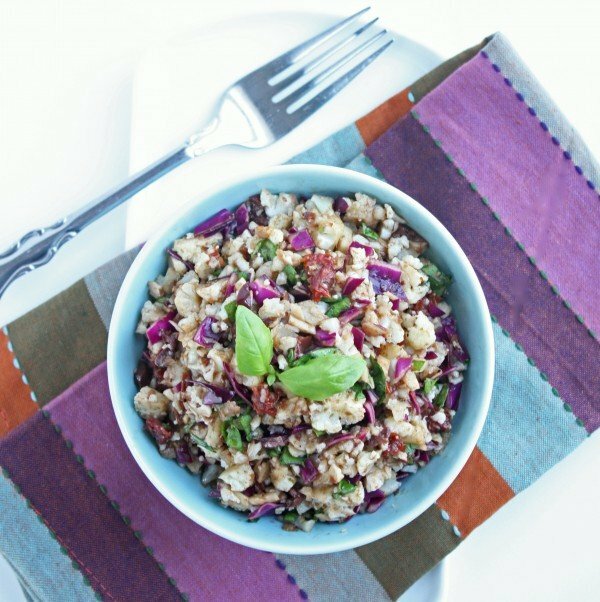 Starting a diet on your own can be difficult and your cookbook has been such a big help. I didn’t have time to go out and get a spaghetti squash this time, so I used zoodles. It came out great! I used about five medium to large zucchini (more than four cups cooked); put the raw zoodles on a kitchen towel covered with paper towel on the bottom and top; and let the moisture drain out for about a hour. I then sauteed the zoodles in olive oil until they were not quite tender. I didn’t add any butter because the I used the olive oil to saute. I love this site. I’m planning to do this 7 day plan as part of a post vacation get back on track plan. I feel really silly for having to ask this, but…I can’t figure out what the bell pepper is for on the shopping list. Can someone tell me which recipe it goes in? Mellissa, I cannot thank you enough for your awesome website and your AMAZING weekly meal plans. I thought keto was going to be a huge pain, and I was really not looking forward to starting. Then I found you and your website. My husband I did the 3 day jump start and are on day three of week 1. The food is all delicious, and it’s easy breezy to cook and track everything. I just wanted to let you know that 3-4 years later, you are still helping people. Thank you, thank you, thank you!! PS. 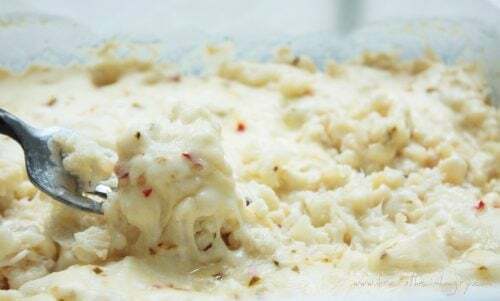 Your cheesy cauliflower puree is the BOMB!! I have tried making mashed cauliflower a couple of times and it always turned out watery and terrible. Yours is hella delicious!! Is it okay if I substitute frittata or eggs for the cream cheese pancakes? I really don’t enjoy pancakes at all… also, what (besides the obvious water) can you drink during Keto? Thanks! Do I just double up on the shopping etc if I’m doing it for 2 or are there leftover etc. I just made all this tonight and I had some left overs. The Sausage & Spinach Frittata I had enough to share with 2 people, the meatballs were for 1, the chili squash I had enough for 1 plus 1 extra serving, The pot roast I had enough for 1, Egg salad is for 1, bacon is for 1, the pancakes are 1, and I will be making the cauliflower tomorrow. I have loved this plan for the last 6 weeks! On week 7, or about to start tomorrow really. I cannot find Ricotta for some reason. Would cottage cheese work? 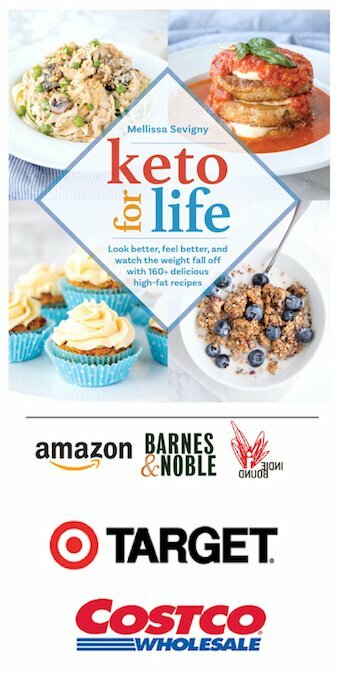 I’ve just recently decided to embark on a Keto lifestyle, and it seemed so daunting. Your blog and these killer weekly meal plans has been the first resource I’ve found that actually makes me feel like I can do this! And I’ve read TONS of blogs, recipes, and articles. I’m sure these weekly meal plans take a considerable amount of time to create, but I’m so thankful you did!! Starting week one on Monday and I’m so excited! I bow to you, woman. New to the keto lifestyle, I am a long term Atkins diet person and the addition of fats has given me so much more energy and my brain is awake for the first time in years. Just bought 2 copies of your book to enjoy and spread the love, but more importantly to support your good work/effort. I hope everyone on here does the same. THANK YOU!!! My husband and I are looking to begin the Keto eating plan and this is incredibly helpful!! The weekly meal plan will take the anxiety out of trying to figure out what we can and can’t eat. Thank you for everything, putting the plan together, the shopping lists, what and how to prep it. So thankful I came across your site!! You’re welcome Irene! Hope you guys have great success! I just had to say THANK YOU!!!! I’ve been spinning my wheels looking at a ton of keto friendly recipes and was one step away from jumping off a bridge. Holy cow there’s just soooo much of nothing out there. You have made this so incredibly easy. And to make my week even better, there isn’t a single shellfish recipe ( I’m very allergic).. Yay!!! So grateful I found your site. Let me be the 10,000th person to say THANK YOU! This is exactly what I needed to get started. I’ll see if I can find the 3 day thing too, but this meal plan looks perfect! Update – I skipped some snacks according to my keto calorie calculator (I’m short!) and I jumbled meals around a bit. But I lost 6 lbs already, stayed in ketosis (verified by my strips) and didn’t feel terrible. Thanks again for all the tips! I just want to thank you for these meals plans! My inlaws are coming to visit and they have recently switched to a low-carb diet. These menus fit the bill perfectly. I love how healthy everything seems. You make it look so simple! If we have a successful week, we might just make this a long term thing. Thank again! That’s great Meghan and how sweet of you to accommodate your in-laws way of eating! I hope the recipes are a hit with everyone! Thank you – your web site has been a LIFE SAVER!!! My doc suggested trying Keto, and while there are a lot of sites out there, most have so many ads and pop-ups that it makes browsing them stressful at best, impossible at worst. Your site has bee user friendly, from a technical view, but also (and more importantly) from an informational view. 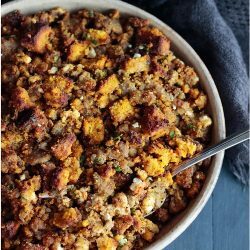 Your recipes look AWESOME – trying to find meals that my family will tolerate has been a concern, and you provide so many options I think it’s safe to say they will not starve, or deviate too far from my newly adopted keto lifestyle. Again, THANK YOU! Thanks so much Jennifer, I really appreciate that feedback! I’m excited for you – keep us posted on your success! I lost 7.8 pounds doing this! And what’s amazing is that most days I only had one snack because I wasn’t hungry, which was amazing since I’m the Bottomless Pit. THANK YOU so much for these plans! OMG, I’m so grateful to you for these meal plans. My girlfriend wanted me to do this a year ago and it was way too much work to put together the daily meals. But thanks to my coworker finding you online I can do this for quite some time, or at least until there are no more meal plans. but by that time I should have managed it. We were skeptical at first, worried the food wouldn’t taste as good as it looked, but to our surprise the meals are amazing. Our diet usually consist of chicken, steak, kale, potatoes and occasion pasta, cokes every day and oh how I love M&M’s. I work 9 hour days and spend 1 1/2 hrs commute each way to work so it doesn’t leave much time to cook. Since I’ve been diagnosed with sleep apnea I have dr instructions to be in bed by 9 to sleep. Okay the real reason why I started now…..my daughter is getting married in September and I need to lose weight, not her words but mine and the doctors. After having been on day 7 of the meal plan, there’s no way I’ll be going back to eating the way I was. I haven’t had any mood swings, my energy level has improved and I actually want to exercise. I did experience 1 day that I had a craving. Friday I wanted chocolate so bad, so I had one (1) peanut m&m and I was fine. I know it sounds crazy but for me I just need a taste of whatever I’m craving and I’m fine. I usually want to fall asleep after every meal, but it’s not happening. The meals are awesome and have opened my palate up to new items. When the recipe called for cauliflower, my husband was like “aw lawd I hate cauliflower”, I said either you stick with the meal plan or you cook for yourself. Well, to say the least he tried the Cheesy Cauliflower Puree & Easy Cauliflower Gratin and loved them both. I thought I would get another taste of both but looked in the fridge and they were both gone. All of the meals are great. I think our favorite to date is the Chili Spaghetti Squash, we had to keep ourselves from eating it all at one time. So after our meal I had to portion everthing out for future meals. Please don’t stop, I have forwarded this link to so many people that I know. I mentioned it on my facebook page and told my friends if they wanted the link I would forward to them. But this is now a lifestylc change for us, and I will be ordering your ebooks. Thank you again, you are definitely a lifesaver!! I’m so happy for you Zina! Thanks for letting me know how well you guys are doing, and I’m always thrilled when a sworn cauliflower hater like your husband is won over by my recipes! Keep us posted on your progress as you continue with the plans!!! I just started the week one this last Monday. I love it! I am down almost 5 lbs, and I feel great. Thank you so much for making these menus available to us. Amazing. Looking forward to trying all the 12 week plans! You’ve got this Virginia! I’ll look forward to hearing about your progress! 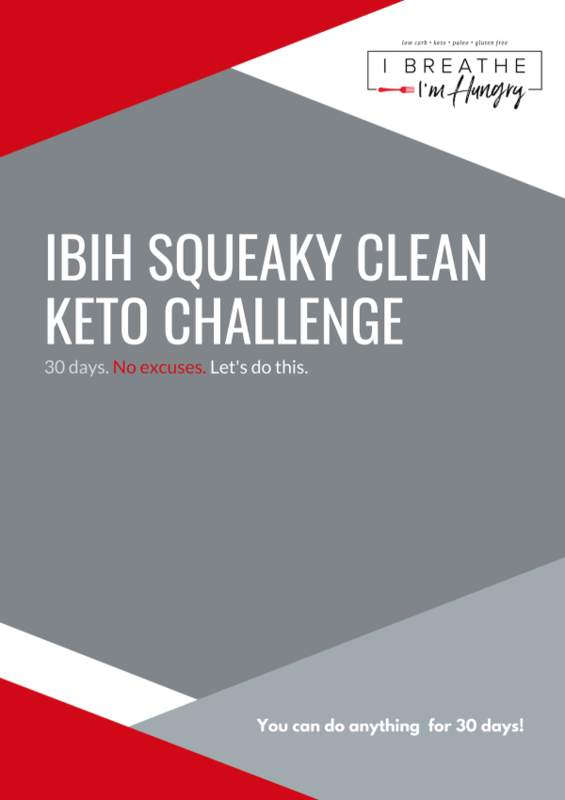 I have never laughed so much reading your 3day keto blog, thank you it was very much needed. Im only on day 3 myself of my new keto venture, but I must admit my body has gone into shock. I have not eaten cheese,cream or butter in 7 years!! I’ve gone from eating porridge oats with fruit and whey protien everyday morning, to cream laden coffee, with added cheese on my eggs. But even on my mere third day, I am definitely noticing I am fuller for longer. My only bug bare at the moment is going shopping and reading the nutrition labels to find that the majority of food has added sugars even meat like sausages even if the packaging states they are 100% meat?? Go figure? Anyway I wanted to also thank you for your above 7 day plan, it’s great and has enabled me to get some ideas on how tweak my diet plan by keeping it varied. It has definitely gave me food for thought…pun intended. 🙂 I will feedback in around two weeks when my body has adjusted to the onslaught. I am currently weighing in at 168lbs and my target goal is 145-150lbs. Fingers crossed and let the constipation commence. Wow, this was exactly what I was looking for. I lost 70lbs on low carb last year and I discovered that (unfortunately) I am one of those blessed souls that can only lose weight under 20g a day. I have looked all over for a low carb-low calorie diet plan and the ones i’ve found consider low carb to be under 100 or even 150g per day! Well that won’t do me any good, lol. This looks great and I have had these foods before so I know that they taste great. Excited to use this as a resource to get back on track, thank you, thank you!! Duuuuude, thank you. Thank you times 1,000. After a grumpy two weeks of trying to figure out low-carb-everything myself and still feed my teenagers a ‘normal’ dinner I was about to throw in the towel. Then I found your site, you’re doing me a huge service having all this info (AND the plan & prep, c’mon?!) in one spot. You’re my low carb lifesaver. Oh my gosh, I did all the recipes from your 7 day meal plan and I make enough for my whole family. This is the BEST food ever!! I have followed your website for a few years and made many items, all of which were fantastic. But the chili over spaghetti squash, So freaking good!! I did not think I would get anyone to eat spaghetti squash and I don’t even like it. But this was just delicious! Everyone loved it! And the spinach frittata, the cuban pot roast, meatballs, the califlower recipes, everything was just out of this world! Please make another meal plan! I was able to get my whole family on board with low carb just because I fed them your recipes. Thank you so much! Woo-hoo! Made it through my 3-day kickstart (actually am on day 5 because of my leftovers, haha), but it put me into ketosis a couple days ago, and I’ve been staying there- being sure to check my Keto Stix daily. 7 pounds gone (though I know some of that is water weight), but today I fee great and am going to get this 7-day menu going! I love this diet, and the food you have on here is awesome! Finally something I feel like I can stick to. Thank you!! Hey! I did the week one and I’m down 8.5 lbs. I’m thrilled!! One thing tho: add peppercorns to the pantry list and the Kraft Mexican cheese mix to the dairy. I didn’t peruse the recipes first and found myself running out for those ingredients. Thank you so much for this! This is really the kind of diet plan I needed: real food, recipes, grocery lists and prep instructions. I can’t thank you enough! Even the substitutions I made weren’t difficult to fit in because so much of the base plan was done for me. I’m not sure I would have been so successful and so eager to continue if I hadn’t found your blog. I currently nursing my 9 mo boy. Should i add say 200 extra calories a day in nut butter or whatever else that healthy and low carb? Keto is similar to Atkins induction phase, but there is no way to tell how fast you will lose as everyone is different. If you feel well enough to exercise then you should, but try not to go nuts with cardio the first few weeks. If you’re following the meal plan then you may have to double some recipes. If you’re just cooking the recipes on your own – most have 4-6 servings so you should be fine for both of you. Hope you have good success! Thank you for an amazing program and recipe archive! It makes transitioning to Keto so much easier! I wonder if you can direct me where to find some of the weeks’ plans; I don’t see weeks 3-6. I love the variety, and the recipes really whipped up quickly. I don’t eat nightshades, so I’ve made a few substitutions. I hope to see some results soon! I’m going to try my keto sticks to see if I register in ketosis yet, but I have never seen them change color. I am so blown away at your selflessness! It is absolutely incredible that you would take the time to do this for people you have never and probably will never meet. May you be blessed with blessings upon blessings! I’ve just joined your Facebook page and will join anything and everything else you have. Your writing style is a freakin hoot! I LOVE IT!!!! So very entertaining. Thank you, really, I sincerely thank you for all the hard work you put into this. Well that rolled in to anniversary dinner out and Christmas parties and shopping(who has time to cook) and on to WTH it is almost Christmas…back on the day AFTER…which prolonged in to wrap up football season and a family-after-Christmas Christmas-party ..and then the NYE celebration and now …well let’s just say my carb addiction certainly had its way with me. Lacking motivation other than the disgust that I felt reading the scale number…running across this post made me feel like a life-line was thrown to me. So. Thank you from the bottom of my heart for the rescue. I am heading out first thing in the morning(not Monday..it is too urgent)…to get back on plan…armed with your shopping list…no excuses. THANK YOU. I feel your pain! Now that I’m back in the saddle it feels great and I’m seeing the scale budge slowly but surely in the right direction again which is empowering! Hope you have great success on the plans – let me know how you do! 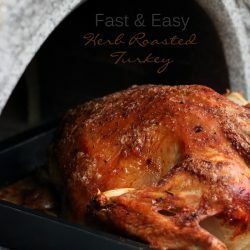 Awesome grocery list at the end, I really like your recipes they seem easy and healthy. I’m looking forward to spending the week cooking your food! Thank you for all you do! You’re welcome Julie – hope you see great results on the plan! OMG! YOU ARE AMAZING!!! THANK YOU THANK YOU THANK YOU!!!! I am in week 1. I already lost 15 pounds on my own but doc said I am pre-diabetic, so here I am. I am 5 foot 8 and weigh 120 pounds, so not sure why my blood sugar is out of control. Anyway, the first meal prep took me 4 hours maybe I am slow, or maybe distracted by my 7 kids, ha ha ha. I just want to feel better and after day 1, I feel great!!! I will let you know how it goes! Thank you for doing all the work for me!! You might be new at this but you did great! 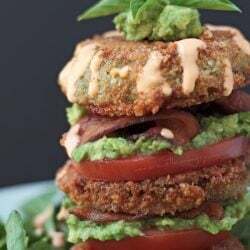 Your menu is almost exactly what I’ve eaten in the last week :) I love eating Paleo always but now I have to loose about 10lbs for the holidays to I’m doing the ketosis steps. At first, if you take the time to look at your labels when you food shop, you’ll find the products that are low, or no carb and high protein – then keep buying the same stuff. You’ll spend less time when you get the hang of it. For example you should be able to find mozzarella or cheddar cheese with no carbs, that way you can have more. Also, there are some great FREE phone apps that help – I use the Atkins Carb Tracker. Hey Mellissa, I just wanted to tell you how much I appreciate all the work you have put into this site to help others. It’s truly amazing! I’ve been on and off low carb and basically making it up as I go. I finally realized I wasn’t losing any weight because my intake of carbs was a whole lot higher than I was thinking. When I found your keto menus- all planned out I figured I’d just had to try it. It’s like having someone hold my hand and guide me through the process. Today is day 1. I am looking forward to letting you know how I progress. Thank you for all the information and guidance you provide. And thanks for being real in your blogs. Also, love the cookbooks! I just got those last weekend. You’ve got me psyched – I am going to be successful and lose this weight!. Thanks so much for building these Keto meal plans! What a huge help. I was on moderate protein, moderate carb and low fat along with being preservative and gluten free so this is a very different approach for me. It’s a welcomed change to feel full while dieting. And your recipes are very satiating. Earlier in the week, I was down a couple pounds, but after finishing Week 1, I’m only down 1 pound total. I’m going to stick with it for a few more more weeks. Hopefully my body will start responding soon. Wow. All the work you’ve done! Thank you from the bottom of our (my husband and me) hearts! I promise to never, ever ask a question that I can answer on my own. And I love math, so substitutions won’t be a problem. I promise. love the food, and I did not have any side effects such as headaches,just added energy. Loving keto diet. Thank you! I’m starting tomorrow, I think, and this will give me some help with ideas. I confess, I got a giggle out of your rant. It amazes me what some people do. Ok I have been having a ball reading all of the comments! I am un-officially starting today, by that I mean I had already had a protein (something sweet) for breakfast, went for a walk, and then got all wound up when I found a bunch of stuff on the keto diet on the web. After looking around, I lit on your site. Good thing. So what I mean about un-officially starting is, I don’t have much meat or fats in the house. Going to store after lunch. Soooo…what to have. I found some tuna in pantry, mixed some of my Coconut cream (about a tablespoon), some Balsamic vinegar, and some dill pickles together – oh – and some cayenne pepper. It would have been heavy on the protein, light on the fat and carbs. But I had to make do. I feel light as a feather. I am sure going to sneak that Cauliflower mash on my husband. He is like feeding a picky three-year-old. I want to cut down on his carbs. I am all in with your diet Mellissa. Will keep you posted on my progress. I just gotta say I’ve been researching for 2 weeks straight now and decided to start on Monday. I had found several “keto startup” menus but they all fail in comparison to yours. They all use hard to find ingredients and some i’ve never heard of. 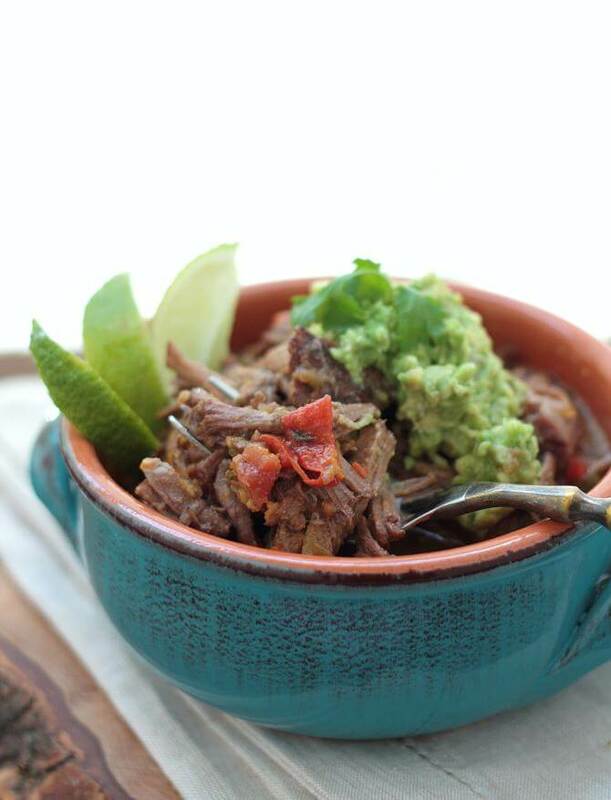 Yours are totally something we can all find in our local grocery stores and you utilize leftovers to make it so easy. Im excited to start my first keto experience and i’m so so grateful you’ve taken so much time out of your day to do this for us beginners. Really makes the stress of it all much lighter. You are officially my favorite person. Thank you for taking the time to do this. I’m newly keto/low carb and your blog is a Godsend! I had no clue where to begin and then I came across IBIH and that was it. Day 3 keto and it’s crazy how I’m not hungry. That NEVER happens! lol Thanks again! First off, thank you for the meal plans. I have eaten LC before, but the meal plans and shopping lists are so helpful when getting back in the swing. Secondly, thank you for the laugh. I loved the are you trying to annoy me part of this post. Sounds like something I would say/write. I always enjoy an unexpected laugh, so thanks again! 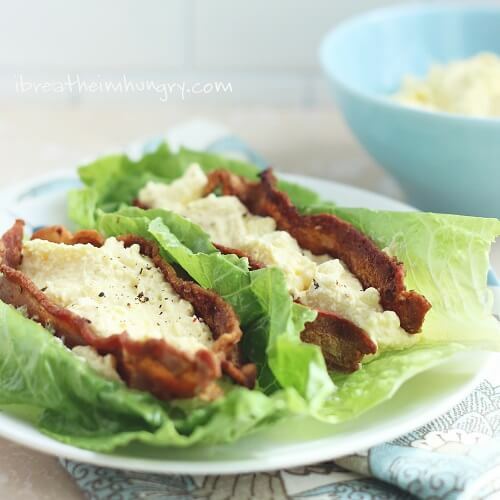 Oh my goodness, I found your site Googling “budget low carb weekly plan,” and I cannot tell you how perfect this is. I put on weight last fall and over the holidays and I feel awful physically and mentally, and so I know I need to get back on the LC horse. I feel overwhelmed with life right now, and I just wanted something that was all set out for me and that didn’t have a brand-new recipe for EVERY meal, EVERY day. (Really…who DOES that?! People have the time and the money for that?! Sheesh!) This looks amazing! It’s even got foods that fit my palate, AND you give a prep plan. You just made a yucky day — medical/insurance woes, blech! — WAY better, and I thank you. Can’t wait to dig deeper into your site! Thanks Jill! 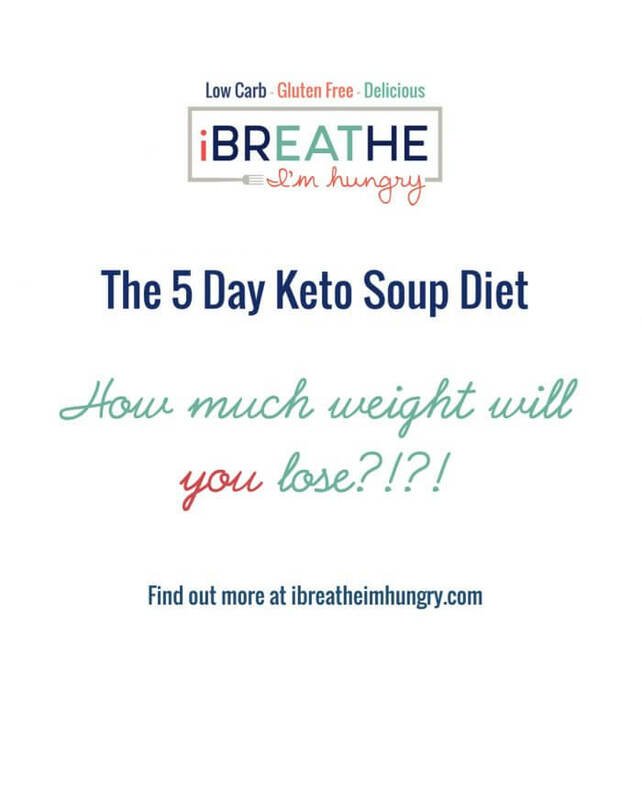 You can definitely go straight to the 7 day if you want to – they will get you into ketosis within 3 – 4 days as well! Let us know how you do! Oh my goodness. You are amazing!! Thank you so much for all of this. I love that you have a list of recipes. You have taken the work out of it for me. That is exactly what I want! Just tell me what to do. I don’t like to cook. My husband does the cooking for our family – he loves to. But he like yummy fattening foods that I am not eating. So I am on my own. So I love that you have taken the work out of it for me. Thank you for all your hard work. You’re so welcome Jeny! I hope you have great success on the plans!!! I stumbled on your blog and it is EXACTLY what I’ve been looking for. A horrible planner needed your help and here it is! Quick question….does your shopping list and meal plan serve one person or more? Just trying to figure out if it will only feed me and I need to double it for my boyfriend, or it feeds more than one. Thank you so much for all of your hard work! There will be leftovers of some of the recipes to share, but the plan is written for one person. If there are two of you doing it, some of the recipes will make enough and others will have to be doubled – you’ll just have to check the amount of servings each recipe makes vs. how many servings you’ll need for the week if there are two of you. Later weeks include a note about how many servings will be leftover for each recipe to help you figure that out! Hope you have great success on the plans! You are an absolute life saver! I really appreciate that you try to incorporate some sweet desserts in there as well because after 6 days of Keto (and 4lbs lost so far!) my sweet tooth is CRAVING. Im so busy all the time that printing out your weekly meal plans and cooking everything over the weekend has been such a blessing. Wow you are absolutely AMAZING! My husband has Type 1 diabetes. Having a keto diet has always help stabilize his numbers. It has been very difficult to stick to and to plan a keto diet so we often struggle to stick to it. Your plan makes everything easier and everything looks so delicious. Thank you sooo much for the hard work you put into making this blog so awesome. I love this plan! Thank you so much! I am waiting on ketostix in the mail, but I have a lot of the symptoms and I’m dropping weight like crazy. Funny how much sweeter those chocolate squares taste on day 5 than day 1. That’s usually a sign to me I have detoxed from sugar; the thought of “regular” sweets alone makes me shudder. No more cravings!! yay. Congrats on kicking the cravings and dropping the weight Charlene! It’s cool how the 90% Lindt tastes gross when you’ve been eating sugar all along, but is the most amazing treat ever when you’ve been off sugar for awhile! So, I’m late to the party but I wanted to say that I’ve decided to take the plunge and I was so, so thankful for the shopping list. I ran to the store on the way home from work today and grabbed (almost) everything I needed. I came home and managed to get the Spinach and Sausage Frittata in the oven, the Cuban Pot Roast in the pressure cooker (2.5 pounds of meat in 40 minutes for the win! ), the Cauliflower Gratin is cooking, and the Sundried Tomato and Feta Meatballs are completely done. It’s only been 90 minutes. I am planning to make the egg salad, cook the bacon, and the Cheesy Chili after the kids go to bed. I’ve made the cream cheese pancakes before and I prefer them on demand and it’s easy since they are dead simple to make. I can’t get over how easy and fast ALL of these recipes were – thank you!!! You’re welcome Grace, hope you’re still going strong! I am still going strong even though there were two dinners out this week for a family anniversary and retirement party. I managed to find decent options at the restaurants – what would I do without the iceberg wedge? – and avoided the bread basket successfully. I’m down 4.5 pounds today and feel great. My only problem is that Mr. Man keeps stealing all of my food. :-/ I guess I’ll make double batches this week. Thanks again for all the amazing recipes! Thank you for your time and all u put into these meal plans they are fantastic! I use Calorie King to calculate, which gives me .1g net carbs per leaf after you deduct carbs. 1 cup shredded is .5g net carbs, so it depends on how much you’re eating. You’d have to eat a LOT of lettuce to get to 3g though so I’m guessing your app isn’t deducting fiber! Hope that helps! Thanks again for the work you’ve done and I can’t wait to try the cream cheese pancakes for myself! Wow! You really are the best! :) And it is important for people to educate themselves… There is no one-size-fits-all lifestyle plan so being able to use these things you provide as a kick-start and a way of learning is an invaluable opportunity! Thanks so much for all you do! Just wanted to tell you that I am amazed that I lost two pounds after just following for two days! I haven’t starved, I’ve actually been more full than usual. I can attribute a lot to drinking extra water again (maybe), but other attempts I’ve made haven’t yielded such fast results for me. This is inspirational and now I’m even MORE excited to continue. 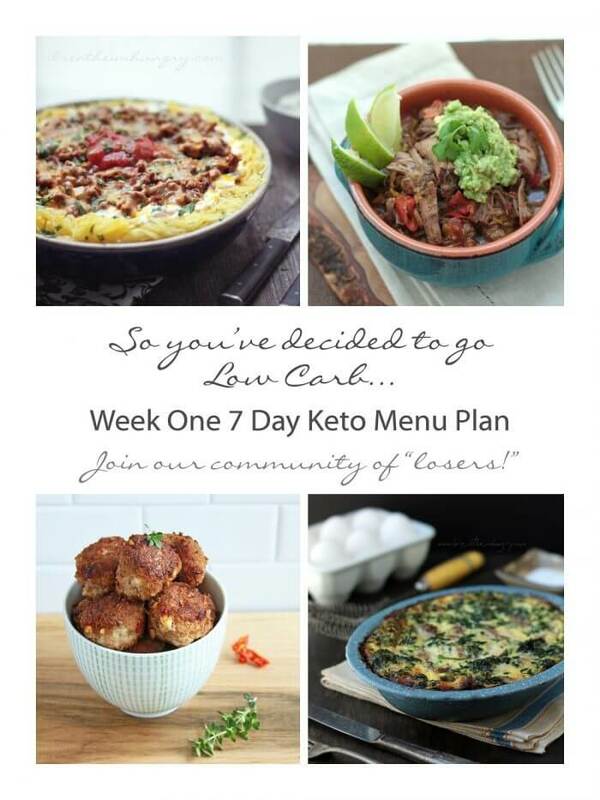 I LOVE LOVE LOVE your recipes, I cannot thank you enough for this 7 day Low Carb meal plan. Recipes, real food that regular people eat! Oh and I don’t have to give up my coffee… just yet. I’ll keep you posted with my ongoing results. After my first week – total lost 11.2 lbs!!! I am soooo excited to have found your blog…it is absolutely so well organized and the food looks dynamite. 9 POUNDS! You are a rock star! And your thanks is more than enough! Keep us posted on your amazing progress – it’s very encouraging!!! This comment made me LOL Brooke! I HATE the sound of other people eating in my ear already, but a chip cruncher? Violence would have been a definite possibility – actually while suffering carb withdrawal make that a certainty! I admire your restraint! ha ha! 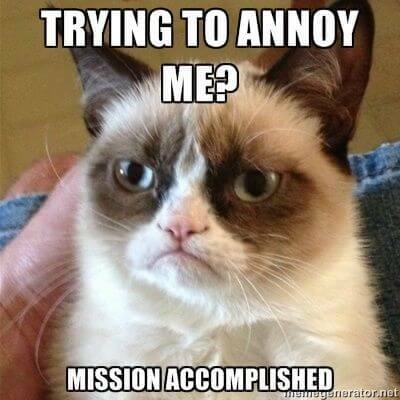 Hopefully by now you’re getting over the crankiness part of it and the worst is over! :) Thanks for the My Fitness Pal recommendation – it’s a great resource!!! You’re so sweet! Part of the issue in my house is that I do all the cooking, so I need things quick & easy and things my husband will eat (thankfully my 13 year will eat anything that won’t eat him first). As far as vegetables go, I pretty much live off green beans, broccoli, onions & peppers. I’ll eat spinach but I’m not a huge fan. My husband will eat it if it’s mixed in a salad. But mostly, he’ll only do leafy greens in smoothies. I’ve tried to do low carb before and failed, partly because I was the only one on board & because I don’t think I was eating *enough, so I was always hungry. I’m excited about trying again though! We’re having the Cuban pot roast for dinner tomorrow. I also have plans to have meatballs for lunch every day at work (using my new crockpot lunch warmer, seriously best thing ever for cubicle workers!) and I’m going to try freezer cooking for a few meals this week too – chicken fajitas (no tortillas for me) and Hungarian goulash. I don’t know the carb counts for either one, but they’ve got to be better than what we’ve been eating around here. I’m planning on really starting next weekend and seeing how I do over the long weekend. I am fairly new to your site and I just am amazed at how generous you are with your followers. I have written out my grocery list and am about to tackle a bit of couponing to try and make this first week a little easier on the budget, but I can see how this will be more affordable in the following weeks. Thank you from the bottom of my heart! This is the first full week plan I’ve seen that doesn’t have tons of crazy food in it that won’t be eaten. I purchased your e-book The Gluten Free Low Carber last week and I am ready to tackle these last 15 pounds with you all. Thank you!! WOW! Melissa you have gone above and beyond on this meal plan! People need to realize how much this plan is worth! I paid over $300 to another keto blogger for a meal plan and you have so generously done all of this work for FREE! I am eternally greatful and have told all of my friends to check out your blog. This is better than any Christmas gift anyone could have given me. You are truly the best and I so appreciate what you are doing! Melissa, I will repeat myself: YOU ROCK! How unbelievably gracious of you to do this, not just once, but again for next week! I tried your “Better than Potatoes” Cheesy Cauliflower Puree (Low Carb)”, and though I think I used the wrong blade on my magic bullet, it ‘crumbled’ it enough that it had substance enough for my fork to really get into it, which then got into my mouth, time and again! I made about 2 cups, and before I knew it, the bowl was E M P T Y! It was THE ABSOLUTE BESTEST EVER non-cauliflower tasting cauliflower I’ve ever eaten. (I used shredded mozzarella, Parmesan, plus added about a slice of bacon, crumbled, garlic and onion powders, salt and pepper to taste). Thank heaven I only made 1/2 as I still have some to make as part of the menu plan for this week! Mellissa, thank you so much for all your hard work in putting this together (so quickly, mind you!). I’m also on Day 1 (but have been doing low carb for many months… just needed a jump start after the holidays). I’ve lost count on how many times I’ve visited the bathroom today. Ha… getting my water in, though! I’ve been full throughout the day and have enjoyed this first day of meals. At first glance, I really like how you organized the Prep List which will help us prepare these meals for the week. Looking forward to the week ahead! Glad to hear you’ve already hit ketosis… great job!! You’re so welcome Kendra!!! I’m in the bathroom constantly too but I just imagine it as dissolved fat molecules leaving me – don’t care if it’s true or not but it keeps me drinking my water that’s for sure! Glad you’re enjoying the first meal plan and hopefully the next one will work for you too! Keep me posted on your progress! And keep drinking your water!!!! ha ha! Thank you so very much, this is just fantastic!!!! Love it!!!!!!!!!! Thanks for the feedback Patty!!! Thanks so much for all of your hard work! 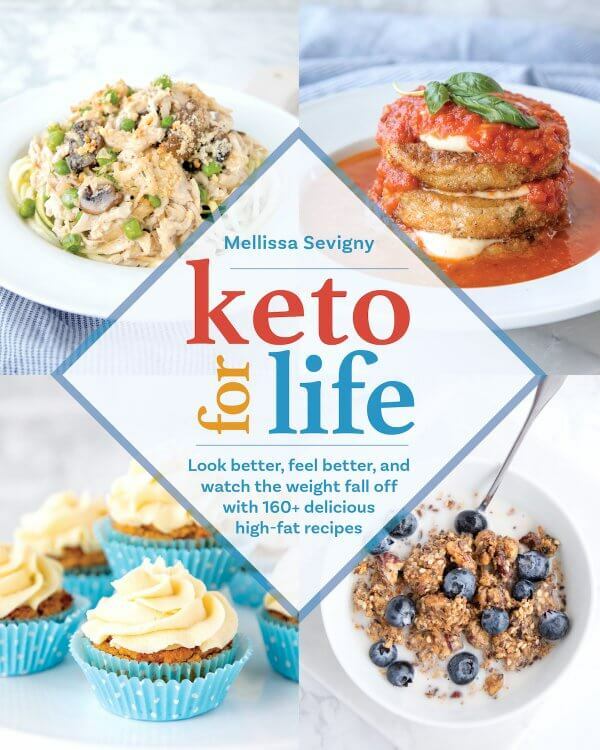 This will give me great guidance to create my own custom menu as I go about my keto lifestyle. You’re so welcome Rae – I’m glad you can use it and make it work for you!!! Thank you so much for this Mellissa! I know it’s a ton of work, but it sure helps keep us on track. I really appreciate you keeping the menu full of family friendly ideas as well. Mellissa, You have out done yourself and I thank you from the bottom of my heart! I can’t wait to get started. You totally rock!!! Thanks so much Nancy, I hope that it helps you stay on track! Keep me posted! Wow! You did a ton of work! How long did this take you? Thank you!!! Your recipes are wonderful and I have been off the wagon so long but have still been collecting your recipes so I am excited to be jumping back on with all of you. I know this works, I know I feel the best when I am eating this way. I just have to realize this is something I need to do forever. You are awesome, Mellissa. Thanks so much for all of the hard work you invested in putting this together! Oh my G. I just laughed and laughed over this it was so funny. I love you already! That’s right we have to think for ourselves. 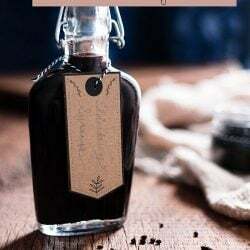 Love your recipes – love your blog. Just starting out on this High fat, medium protein, low carb diet. I am aim’n to loose 30 lbs. I’m gonna do it this time. I mean it. Before I get ill. I am so gonna try the Cauliflower puree! Welcome Rita! Keep us posted on your progress!!! Can you please do a “Ketosis Approved” food list? Instead of menus, how about a list of foods that we can use to make our own meals, showing the amount of carbs, protein, calories and fat… this way we can make our own menus, with foods we like, and be able to see what we are taking in. Honestly, the menus posted arent really for me. I eat alot of eggs and chicken when I keto…. 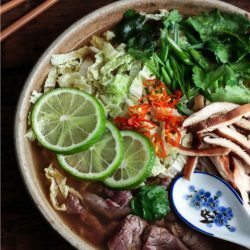 I just cant seem to find a keto food list of approved foods that you can mix and match based on carbs, protein, fat and calories, and sadly im always to low on fats.. I think someone looking at a food list and seeing how they can combine different items to inspire different menu ideas could be cool. Maybe even do a comment section under the list where ppl can post their keto friendly recipes. That would benefit everyone. If you already have a list like this that I overlooked, please let me know. Thank you! I’m afraid the only guideline I provide is 20g net carbs per day because even keto approved foods like nuts and cheese can be overeaten and kick you out of ketosis. Other than pure meat or fats, everything contains some carbs. 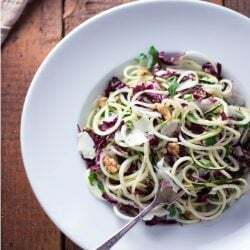 So you can mix and match your proteins and fats, add in some keto friendly veggies in moderation – but you’d still need to count your carbs strictly or you won’t stay in ketosis. You can overeat cauliflower, squash, even greens if you aren’t careful. So a list of keto approved foods won’t really help you if you aren’t already counting your carbs, and if you ARE counting your carbs, even fruit or potatoes if you were really craving them can be eaten in small amounts – as long as your daily carb amount doesn’t exceed 20g net. I second this !! Seriously, your blog is amazing and has really helped me to see that I CAN do this!! And that’s because you’ve done all the hard work for me!!! Thank you so much for sharing!! !